[SOUTHHAMPTON, NY] At 4pm on July 8th, 2012 a diverse coalition of activists and occupiers from across New York will descend upon a fundraiser for presidential candidate Mitt Romney at the Southhampton home of billionaire David Koch. Citing the ever-growing and pervasive influence of Koch Industries’ money on our electoral system, organizers from Occupy Wall Street, The Long Island Progressive Coalition, Greenpeace, Move to Amend [Brookhaven], ALIGN NY, Art Not War, Strong For All, MoveOn.org, United New York, Occupy Storefront and Occupy Huntington, Long Island, have announced that they will take action to non-violently disrupt the fundraiser at David Koch’s shorefront estate located at 880 Meadow Lane in Southhampton. 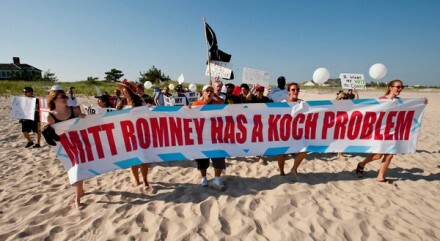 While Romney plans on attending 3 fundraisers that day in the Hamptons the demonstrators have made it clear that the Koch Estate will remain their only target. The coalition of activists initially assembled by the End Corporatism Affinity Group of Occupy Wall Street will be taking a non-partisan stance, uniting around a unified message that corporate money is exponentially diluting and subverting our democratic process (a phenomenon not limited to one single party.) To the demonstrators, David and Charles Koch embody everything that is wrong with money in politics. “The Long Island Progressive Coalition is busy coordinating a network of Long Island groups who won’t stand by while their backyard is used for Koch and Romney to fund a regressive political agenda,” says Lisa Tyson, director to the Long Island Progressive Coalition. But it’s not just the money that has sent protestors into a frenzy across the country, it’s also the Koch agenda. David and Charles Koch are seen by the protestors as the architects behind Wisconsin’s challenge to the collective bargaining rights of unions. They have also actively financed public relations campaigns aimed at dispelling climate change. According to Kert Davies, the director for research for Greenpeace the Kochs have spent more than $50 million since 1998 on “various front groups and think tanks who … oppose the consensus view that climate change is real, urgent and we have to do something about it.” Moreover, Koch Industries remains a driving lobbying force behind the controversial Keystone XL tarsands pipeline, a project opposed by the President as well as environmental and native groups across North America. Protestors will assemble at 3pm at the public parking lot at Southhampton’s Cooper’s Beach (located at 286 Meadow Lane, Southhampton) and at 4pm march with banners and creative visuals to the home of David Koch (located at 880 Meadow Lane, Southhampton) a map with expected protest locations is provided below. *Busses will be provided for protestors from New York City who wish to attend. These buses will depart from New York’s Union Square at 12pm and arrive in Southhampton by 3pm. To reserve a spot on the bus please reply via facebook HERE. Tagged david koch, fundraiser, hamptons, long island progressive coalition, mitt romney, occupy wall street, protest. Joining the governor at the Waldorf fundraiser will be Jamie Dimon, JP Morgan Chase CEO and John Paulson of Paulson & Company. Politico has published a partial list of the event’s co-chairs HERE. Tagged mitt romney, occupy wall street.